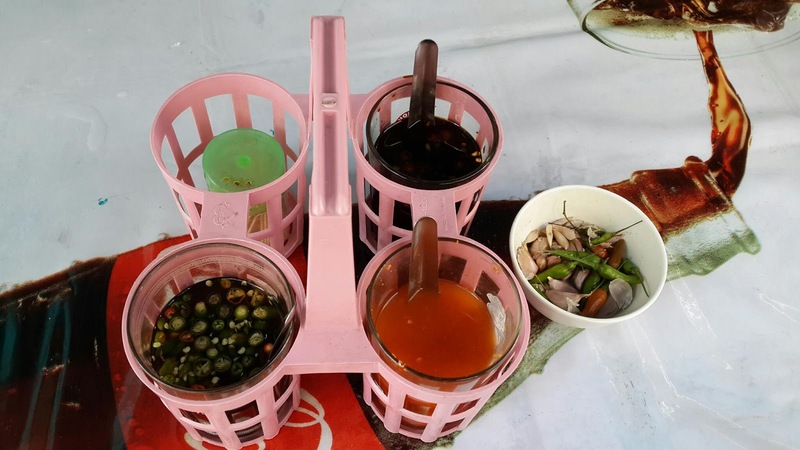 There's many small food stalls inside this alley selling varieties of noodles, mixed rice, pork knuckle rice, traditional kuih and drinks. We opted a open air noodles stall. 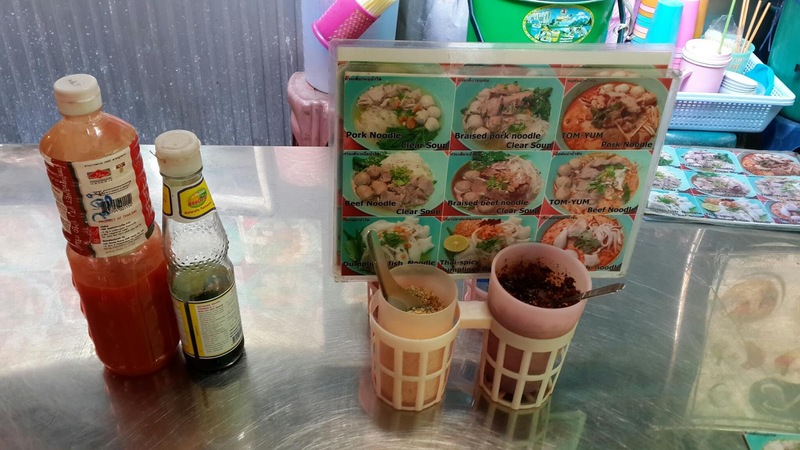 Kenny choose Tomyum Noodles while I ordered Chicken Soup Rice Noodles. 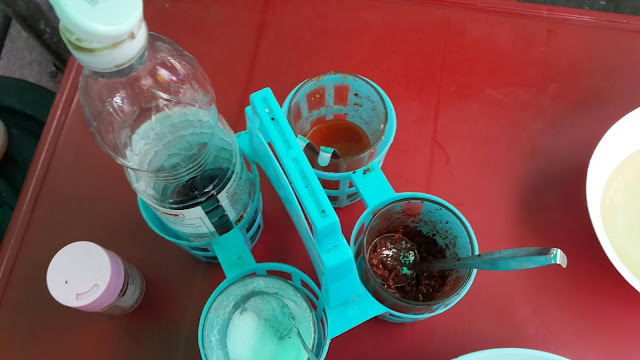 On the table, there's chilli flakes, peanut, sugar, chilli etc for customer own seasoning. 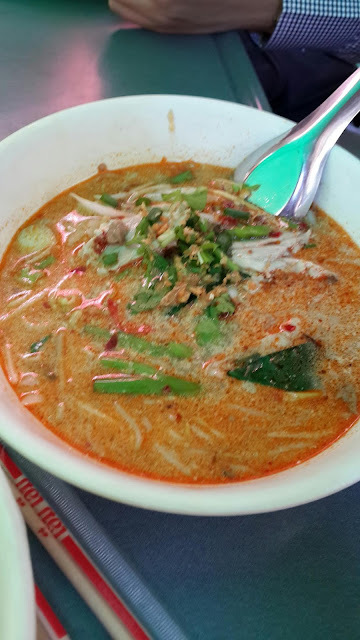 Tomyum Soup Noodles (40THB). It's non spicy, taste sour. Chicken slices was tender. Taste ordinary. 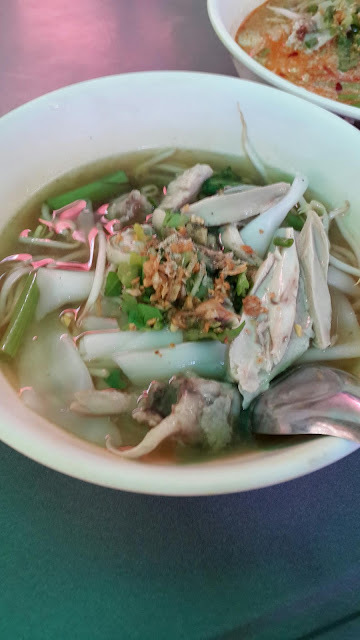 Chicken Soup Rice Noodles (40THB). Chicken soup with rice noodles, drumstick, vege and fried shallots. Soup was spicy and strong black pepper taste. Chicken drumstick was tender and smooth rice noodles. Thumb up. This food street was just right infront A&W Pantip Plaza, beside Platinum Fashion Mall. 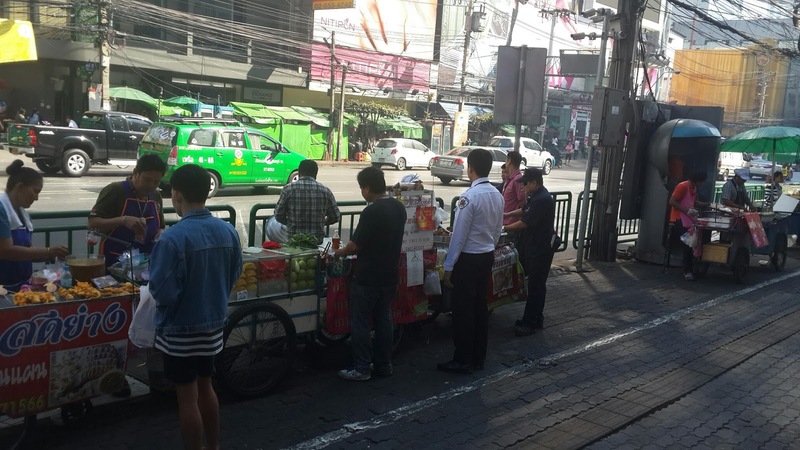 Stall here were mainly selling street foods - BBQ Pork, Deep fried stuffs, noodles, Pork knuckle rice, fruits etc. Customer here were mainly local take away. Stalls here were in rotation of morning till afternoon and night shift. 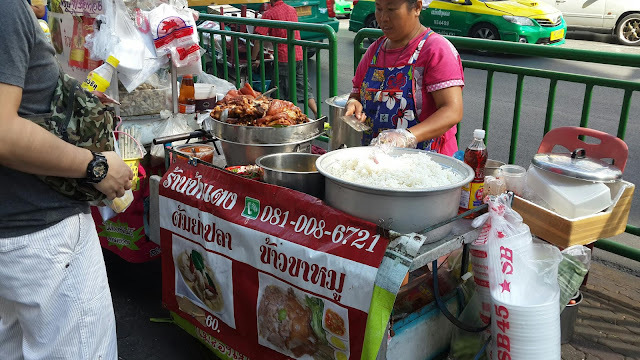 Pork Knuckle Rice (60THB). 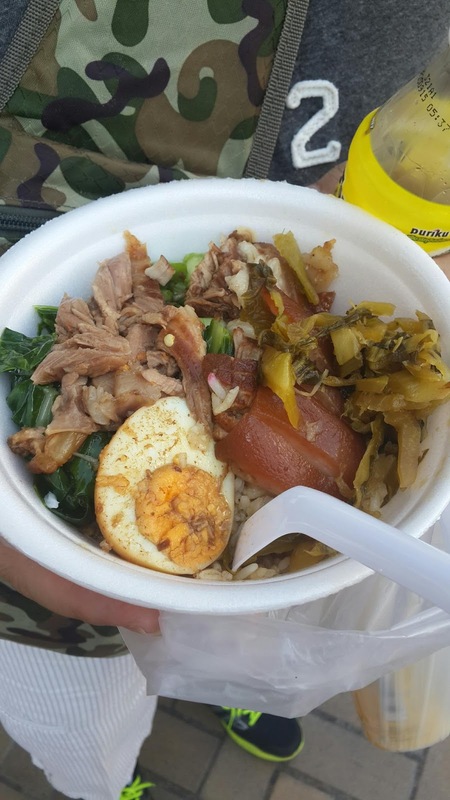 Rice served with pork knuckle, vege, egg and preserved vege. 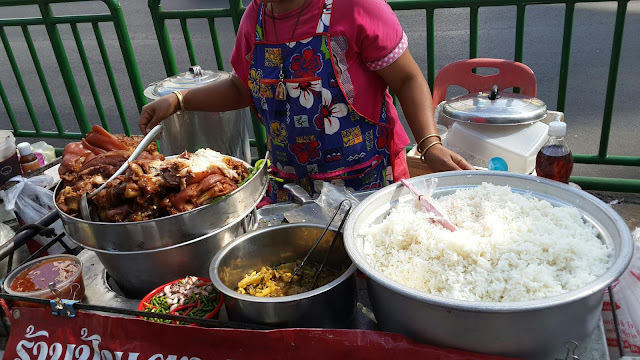 The rice texture and flavour was enriched with the brown sauce, pork knuckle meat was tender and fats melted in my mouth.. But the egg was...overcooked. Note that you have to stand and eat this piping hot rice or take away because there's no table and chair provided. Come earlier ( before 11am) to avoid disappointment because this is selling fast. 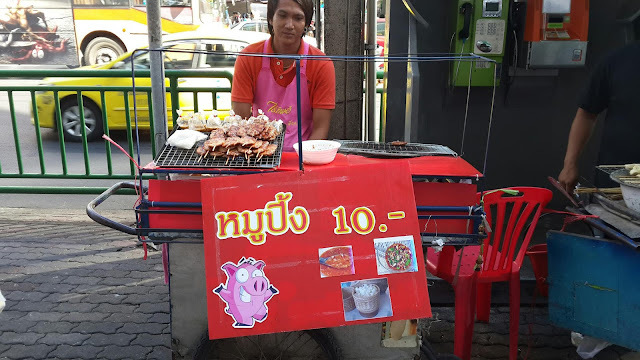 BBQ Pork (10THB). THE BEST BBQ PORK I EVER ATE IN BKK. Tender, juicy, perfect proportion of fats and meat and the sauce was just nice! Strongly recommended. 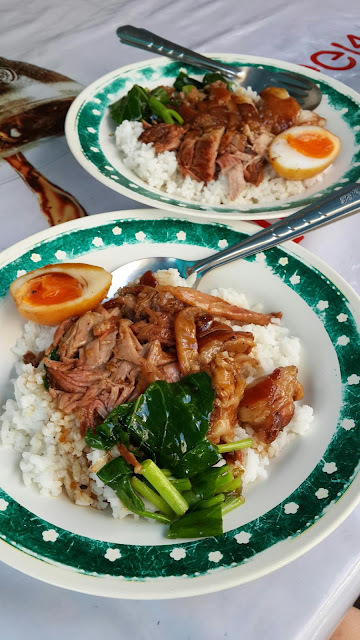 Pork Knuckle Rice ( 60THB ). Generous amount of pork knuckle on top of the rice with fragrant brown sauce. Pork knuckle meat was juicy, tender and flavorful, served with soft boiled braised duck egg was a plus point. Kenny bought Green Tea Latte from the small café opposite this little stall. 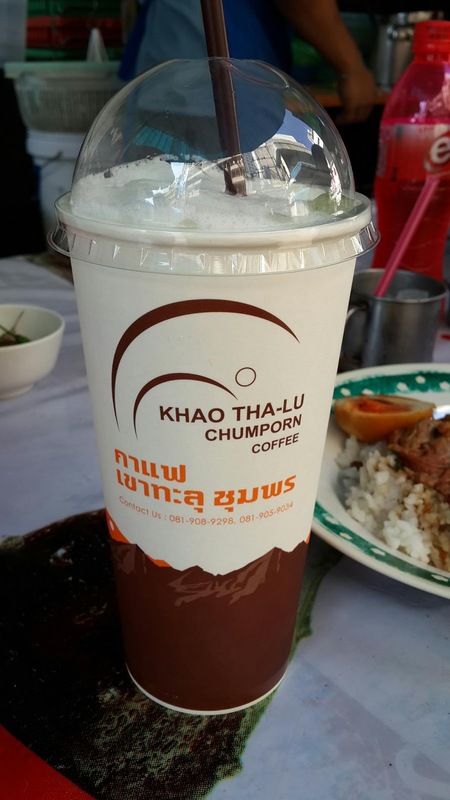 Taste awesome. Well balanced of green tea and milk and not too sweet. 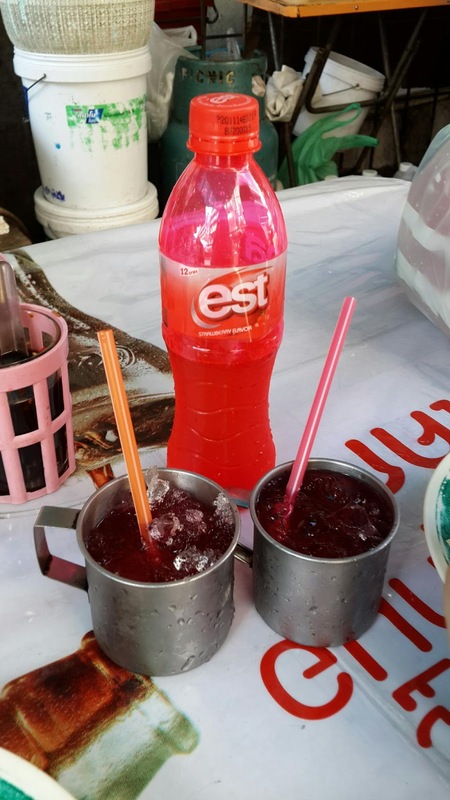 It's a pleasure to have cold drinks during super hot weather in BKK! 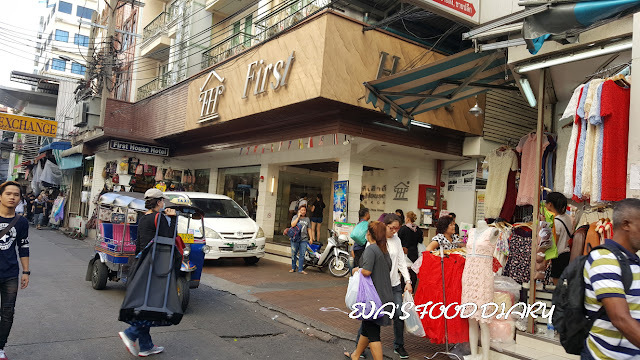 This alley was located opposite the famous Pratunam Wan Tan Noodles shop / First Hotel, beside 7-11. You will see a fried banana stall outside of this alley. Stalls in this food alley was selling varieties of noodles, mixed rice, porridge, pork knuckle rice and drinks. 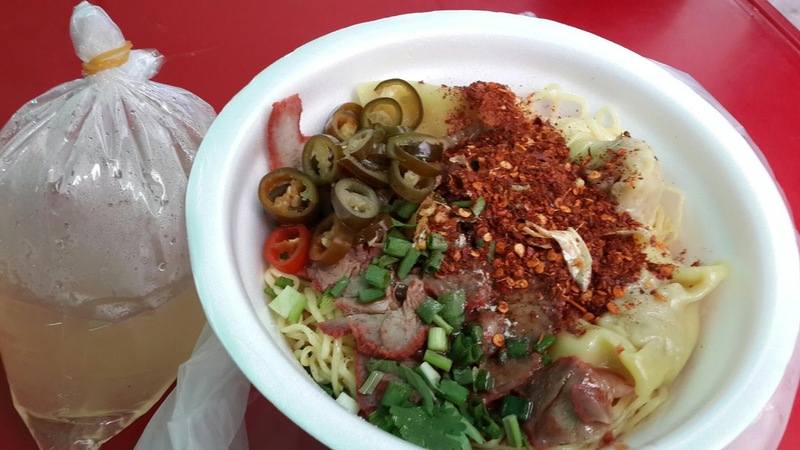 Pork noodles ( 40 THB). Glass noodles soup with strong spicy pepper taste, served with fresh and tender pork and pork blood cubes. Nice! 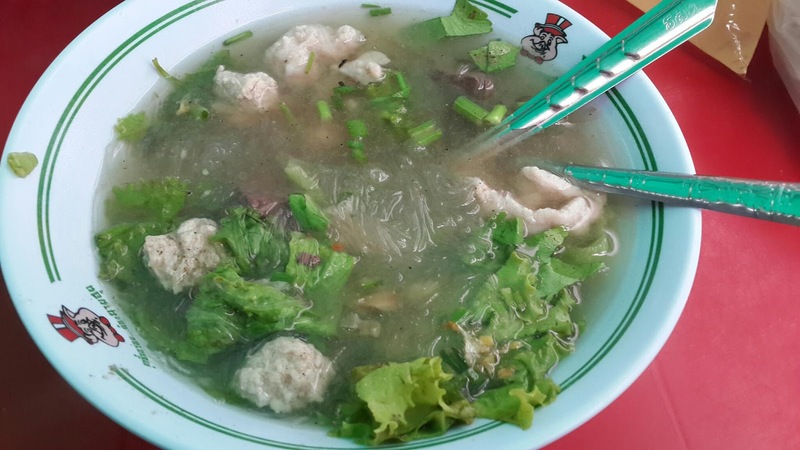 WanTan Noodles (50 THB). Springy egg noodles topping with Char Siu, wonton, chilli and chilli flakes. Taste ordinary. 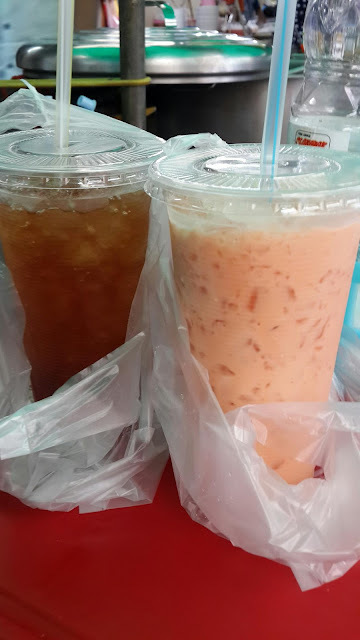 Thai Tea & Thai Milk Tea ( 25 THB each). Taste below average. Too sweet and milky for my own preference. Barely can taste the tea flavour.